Fred Astaire was a famous dancer and choreographer (one who creates and arranges dance performances) who worked in vaudeville (traveling variety entertainment acts), musical comedy, television, radio, and Hollywood musicals. In 1933 Astaire married Phyllis Livingston Potter and shortly afterward went to Hollywood. He had a featured part in Flying Down to Rio (1933). The film was a hit, and it was obvious that Astaire was a major factor in the success. The Gay Divorcee (1934), a film version of Gay Divorce, was the first of Astaire's major pictures with Ginger Rogers (1911–1995) and an even bigger hit. With seven more films in the 1930s (the most popular of which was Top Hat in 1935), Astaire and Rogers became one of the legendary partnerships in the history of dance, featuring high spirits, bubbling comedy, and romantic chemistry. By the end of the 1930s the profits from the Astaire-Rogers films were beginning to decline. Over the next few years Astaire made nine films at four different studios and continued to create splendid dances, appearing with a variety of partners. In 1946 Astaire retired from motion pictures to create a chain of successful dancing schools. In 1947 he returned to movies to make the highly profitable Easter Parade at Metro Goldwyn Mayer (MGM). Nine more musicals followed. Astaire's success was marred in 1954, however, when his beloved wife died from cancer. Ginger Rogers, Astaire's longtime dance partner, passed away in 1995. Rogers is often quoted as having said, "I did everything Fred did, only backwards and in high heels." Their partnership lasted sixteen years, from 1933 to 1949.
works are preserved in their original form. Astaire's dances are a blend of tap and ballroom dancing with bits from other dance forms thrown in. What holds everything together is Astaire's class, wit, and apparent ease of execution. Astaire spent weeks working out his choreography. He also created an approach to filming dance that was often copied in Hollywood musicals: both camerawork and editing are used to support the flow of the dancing, not to overshadow it. 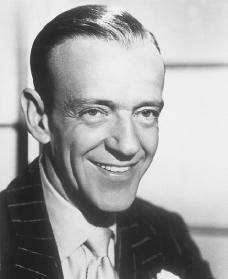 Although his shyness and self-doubt could make him difficult to work with, Astaire was an efficient planner and worker. His courtesy, professionalism, and struggle for improvement earned him the admiration of his coworkers. In January 1997, with Robyn Astaire's blessing, Astaire's image returned to television through special effects editing—Dirt Devil inserted its vacuum cleaners into dance scenes from Astaire's films for three of its commercials. The press criticized the commercials. The general feeling was that replacing Ginger Rogers with a vacuum cleaner was in poor taste. Adler, Bill. Fred Astaire: A Wonderful Life. New York: Carroll & Graf, 1987. Gallafent, Edward. Astaire & Rogers. New York: Columbia University Press, 2002. Mueller, John. Astaire Dancing: The Musical Films. New York: Knopf, 1985.